Tour de Ski men's freestyle sprint semifinalists. Tour de Ski women's freestyle sprint semifinalists. I’ve removed Roger Aa Djupvik from the men’s plot, as he ran into a spot of difficulty in the quarters and packed it in for a very slow time. It’ll have to wait until the end of the season, after I’ve accumulated more of these sprint results, but I’m beginning to get the sense that there’s a real difference between the men/women in how the speeds of each round plays out. My general sense is that the men’s heats are more likely to slow down as the day goes on, but that’s just based on my gut sense from looking at a bunch of these. I’ll do something more formal later on. 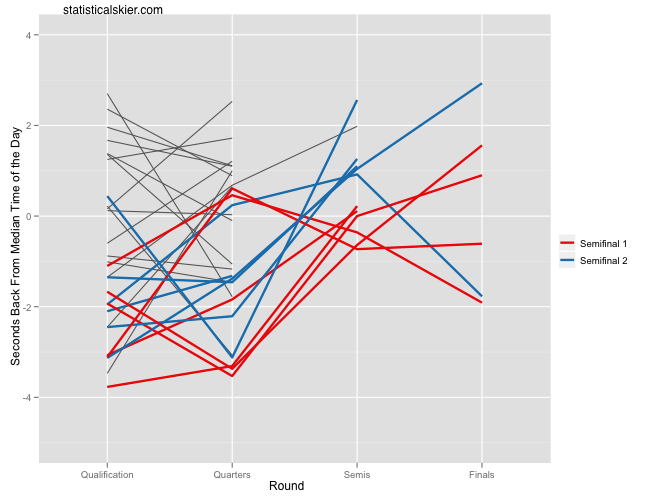 There’s a clear difference in speed between the two semifinals for the men, less so for the women. However, keep in mind the scale here, where differences that look large visually may be as small as 0.5-1.5 seconds. Jesper Modin went decisively in one direction and it wasn’t the right one. 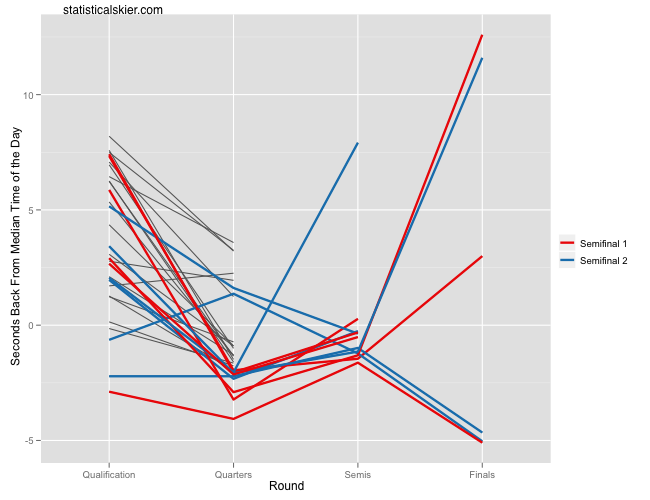 However, we should be careful reading too much into the men having slower times in the semis, as those rounds were slower across the board. So for instance, the drop off with Hellner and Oestensen was most likely as much tactical as it was fatigue. 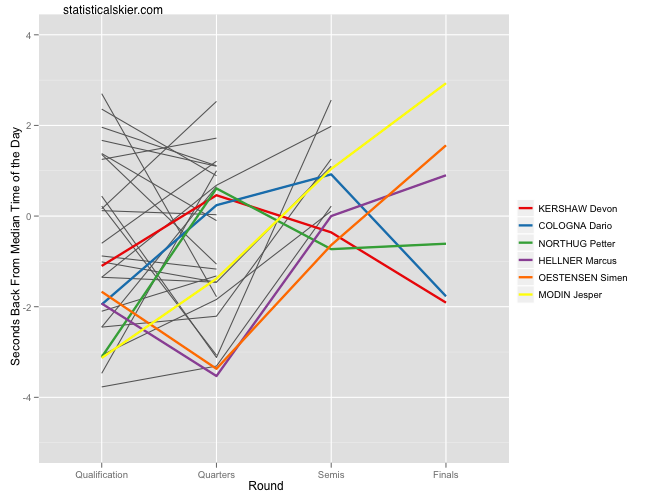 Both Cologna and Kershaw seemed to pace themselves well, managing to ski relatively slower in the early rounds and still advance. Petra Majdic was quite dominant again today, although not by quite as much as before. It’s certainly a bummer for us Americans (and the Swedes, too, I imagine) that Randall got tangled up with Johansson Norgren in the final. Without that unlucky break we could very easily have had two North Americans on the podium today. Surprise finalist Laure Barthelemy did well to advance, but ran out of gas in the final. 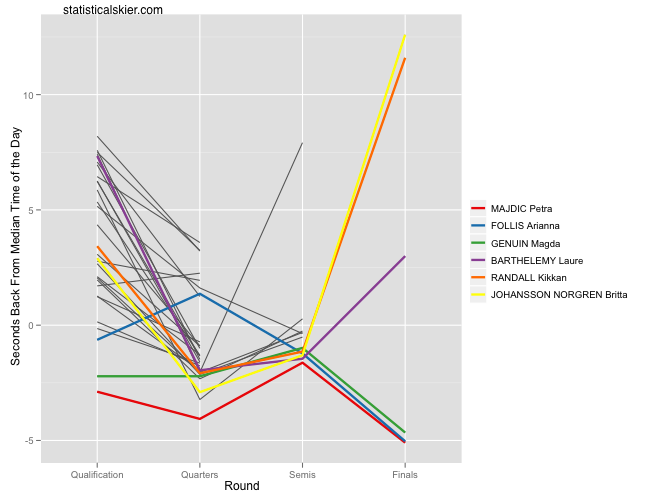 Arianna Follis benefitted from drawing a very slow quarterfinal (#5), after which she skied successively faster rounds all the way through the final. Amidst all the celebration on this side of the Atlantic today I’ll offer a note of caution. To some degree, mixed up sprint results are to be expected mid-way through an event like the Tour de Ski. We’ve seen several top skiers drop out (cf Emil Jönsson), and many of the top women failed to advance to the finals today, showing either fatigue or tactical savvy. I don’t think that takes anything away from the accomplishments of Kershaw (or Harvey or Newell or Randall) today, but it does effect how cautious we should be about projecting these results forward. Kershaw hasn’t displayed this kind of consistent sprinting ability outside the Tour, which is just a different animal than one-off World Cup sprints, so I wouldn’t be shocked if his best sprinting returned to the 13th-25th zone after the Tour. It’d be nice if I were wrong, though. Posted by Joran on Wednesday, January 5, 2011, at 3:00 pm. Filed under Uncategorized. Tagged devon kershaw, freestyle, kikkan randall, recap, Sprint, tour de ski. Follow any responses to this post with its comments RSS feed. You can post a comment or trackback from your blog.